For us, the MX-5’s three-decade history means more than just a record-setting period of time. Rather, it is the culmination of the inspiration — and perspiration — of so many people: the passionate Mazda engineers who created the first-generation MX-5 as a homage to the earlier lightweight European sports cars that excited motor sports fans worldwide; succeeding development engineers who took up the challenge to build on the high ambitions of their predecessors; and the unshakeable support of owners and fans all over the world. At Mazda, the true value of MX-5’s history lies in the accumulation of the thoughts, hopes and dreams of the people involved over these thirty years. I firmly believe the 30th anniversary we are celebrating this year draws its meaning from being a collective history shared by all these people. Reaching cumulative production of over one million units in 2016 is just one of the outstanding results we have achieved together. To show our gratitude and appreciation of all the people involved in MX-5’s history we have produced commemorative models at each 10-year anniversary. These special editions not only feature exclusive mechanical parts and tuning, they also offer distinctive body colors aimed at strengthening our bond with MX-5 fans. The 10th anniversary was marked with Innocent Blue Mica. At the 20th anniversary we introduced Aurora Blue Mica, True Red and Crystal White Pearl Mica. And at the 25th anniversary, to mark a quarter-century of production and the last of the third-generation MX-5, Soul Red Premium Metallic. For the 30th-anniversary model, we developed Racing Orange, a strikingly vivid body color. The starting point for this entirely new color was the yellow of the MX-5 Miata Club Racer, exhibited as a show car at the 1989 Chicago Auto Show along with three production models in red, white and blue. In general, yellow is a good match for a sports car thanks to its high brightness and chroma, both strongly suggesting a feeling of passion. 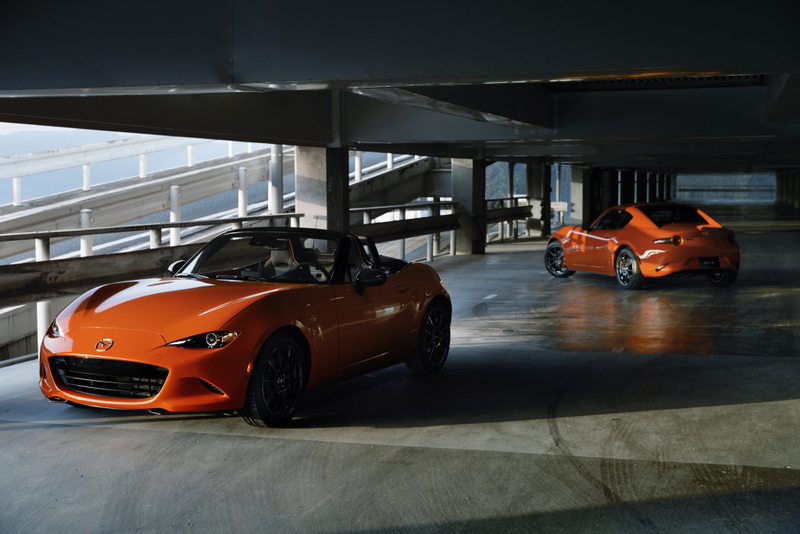 However, we wanted to go beyond simply reusing the color of the 1989 model and instead, to celebrate the future of MX-5, created a special new orange evocative of sunrise and anticipation. In addition to this commemorative model, our booth at this year’s Chicago Auto Show echoes our 1989 booth with three other MX-5s in red, white and blue, symbolizing the start of the story and showing our respect for every generation of the MX-5. The commemorative model also offers many other exclusive features: forged aluminum wheels by RAYS Co., Ltd. in dark gunmetal paint, with a design based on the wheels fitted to Global MX-5 Cup race cars; orange calipers (Brembo at the front, NISSIN at the rear); Bilstein dampers (manual transmission models only); and RECARO seats with orange contrast stitching and piping. These exclusive specifications bring the dream of the 1989 Club Racer show car to exciting new life and further enhance the unique driving pleasure of the MX-5. Production of this 30th-anniversary commemorative model will be limited to a total of just 3,000 units in soft-top and RF versions available worldwide. Nothing could give me greater pleasure than to see this special-edition MX-5 deliver the ‘Lots of Fun’ we have fostered over three decades together with owners and fans, as well as anticipation of the excitement that future MX-5s will bring. The newly developed Racing Orange keynote color is a precision blend of the pigments that make up the color orange, with a tightly controlled optimum balance of chroma and brilliance. And to better express the MX-5’s pure sports characteristics, the development team chose to make it gloss, rather than metallic. The vivid orange body contrasts strongly with other exterior parts such as the piano black A-pillars, door mirrors and seatback garnishes, as well as the dark gunmetal wheels, to emphasize the anniversary model’s exclusivity. These lightweight, high-rigidity wheels were co-developed by Mazda and RAYS Wheels exclusively for this anniversary model, with a design based on the RAYS ZE40 forged aluminum wheels used by all participants in the Global MX-5 Cup race. The soft-top version for the Japanese market is fitted with 16-inch wheels, while the RF version for Japan and all models for overseas markets are equipped with 17-inch wheels. Both sizes feature a finely honed spoke design combined with dark gunmetal paint to point up MX-5’s exhilarating driving pleasure. Orange is the key element in the anniversary model’s color coordination. Outside, front and rear brake calipers are painted a vivid orange, enhancing their visibility through the dark gunmetal colored wheel spokes to emphasize this special edition’s sporty look. Inside, contrast stitching on the door trim, instrument panel and shift lever is also colored orange. And the standout orange piping on the black seats powerfully attracts the eye. In total, the orange accents in the cabin combine with the Racing Orange body color on the upper door trim to further enhance the anniversary model’s sense of exclusivity and pride of ownership. The MX-5-dedicated sports seats were jointly developed by Mazda and RECARO to provide firm support and outstanding hold. For the 30th-anniversary model, orange stitching and piping add to the exclusive impression and quality feel worthy of a special edition. These specially tuned dampers realize smoother vehicle behavior and an enhanced feeling of unity with the car. Combined with the exclusive forged aluminum wheels by RAYS, Bilstein dampers provide an even more controlled yet refined ride. Front disc brakes feature 15-inch aluminum calipers with four opposed pistons (diameter: 34mm), mated to low-carbon steel pads with a stable friction coefficient. This Brembo braking system achieves an extremely rigid feel in high-G driving situations, with consistent effectiveness and outstanding controllability. Seat headrests each feature a pair of built-in speakers with sound tuned by TrueSpace® technology by Bose®. This enables enjoyment of clear and powerful sound in any driving environment, providing a broader soundscape even when driving with the top open. The Mazda Connect system in the special edition MX-5 supports Apple CarPlay® and Android Auto™. Through a simple USB connection to the car’s system, customers can easily use applications on their iPhone® or smartphone via Mazda Connect’s Human-Machine Interface (HMI). Usable applications are limited according to the individual smartphone’s in-car system. Apple CarPlay®: The smarter way to use your iPhone® in the car. Make calls, send messages, listen to Apple Music®, and get directions with Apple Maps® with your voice through Siri®. Android Auto™: A simpler way to use your phone in the car. Say “Ok Google” to use Google Maps, Google Play Music, media, and messaging apps in the car. Note: Apple CarPlay, iPhone, Siri are trademarks of Apple Inc. Note: Android and Android Auto are trademarks of Google LLC.